This is the fully customized Applictaion for your Own brand, Own Company name, Own Product name, Own website address. 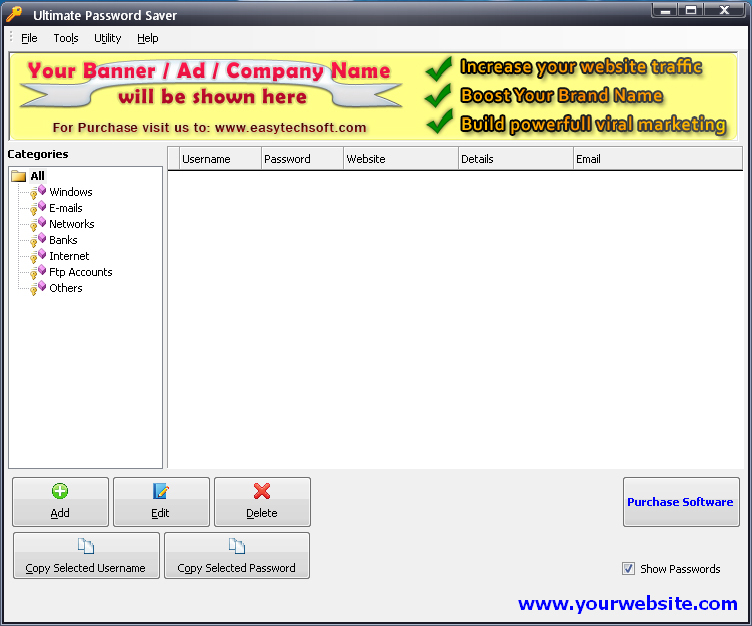 Rebrandable Password And Link Protector is a light-weight and easy-to-use password manager for Windows. 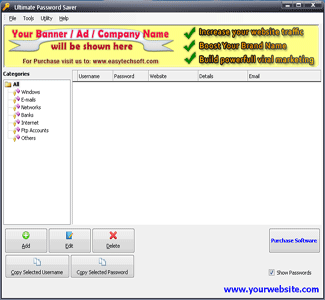 This software is use for store your valuable password, usernames, web links etc. Today you need to remember many passwords. You need a password for the Windows network logon, your e-mail account, your website's FTP password, online passwords (like website member account), etc. etc. etc. The list is endless. Also, you should use different passwords for each account. Because if you use only one password everywhere and someone gets this password you have a problem... A serious problem. The thief would have access to your e-mail account, website, etc. Unimaginable. But who can remember all those passwords? Nobody, but "Rebrandable Password And Link Protector" can. This software supports password groups, you can sort your passwords (for example into Windows, Internet, Bank A/c, etc.). You can simply copy and paste your username, passwords into other windows just one button click. The powerful auto-type feature will type user names and passwords for you into other windows. You can simply copy and paste your username, passwords into other windows just one button click. Suggested Price: Free To $35.